Monday was quite eventful around the cabin. 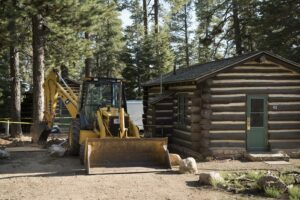 Work on the sewer line leading from my cabin that started on Friday escalated into a major project by Monday morning. A maintenance worker was initially checking on temporary patches put on the line and to install an outlet where they could clear the pipe if there were any clogs. After some digging by hand two men found more holes in the pipe and lots of tree roots intertwined and reducing the flow. 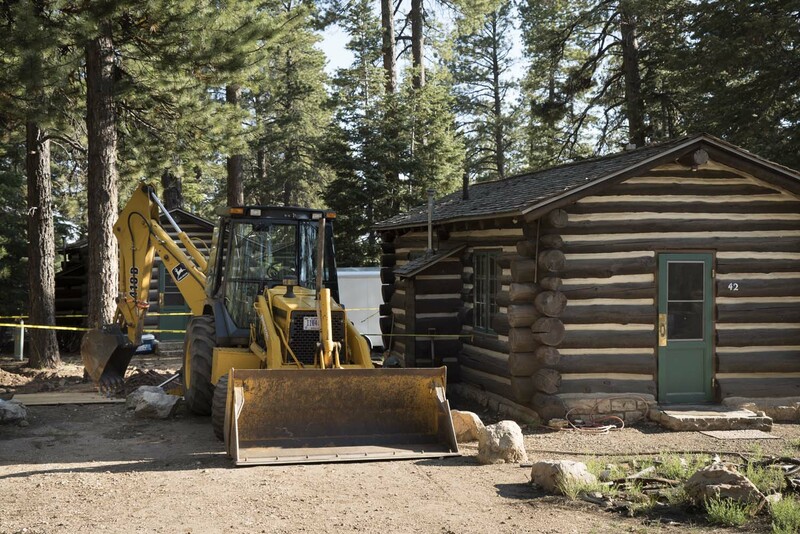 I went away briefly and when I returned I saw this large backhoe parked by the cabin. Now they were doing some serious digging. By the end of the day they discovered all sorts of problems. They were to return Tuesday morning to replace most of the pipe, in the meantime they had shut off my water and none of the plumbing could be used. One told me I could use the campground facilities, which aren’t far but it was like camping in my cabin, without the fun of a tent. I got a gallon of water from a campsite and saw the nearest bathroom about ¼ mile from the cabin. Well, the inconvenience lasted just overnight, by the late morning the new pipe was installed and water was running. The moon hovers over the tree line. By those standards the rest of the day was boring. My friend Rush Dudley from Albuquerque arrive from visiting his son in Oregon. 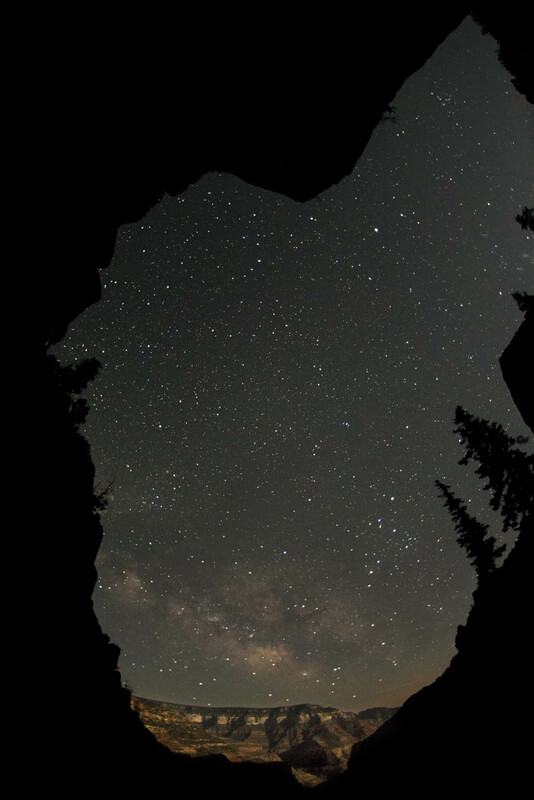 He’s staying in the nearby campground and wants to go out for some night sky photography. In the evening we hiked down the North Kaibab trail, though not far. He stopped at the Coconino Point, about .7 of a mile down, I continued to Supai Tunnel, about another 1.3 miles where there is a good view of the canyon and a water source and toilets. 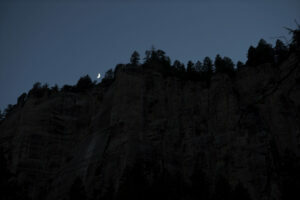 My plan was to hike while it was still light, photograph the scene at night, then hike back out. I’d be able to get some nice photos from below the rim of the canyon. The moon hovered above the trees on the rim as I hiked down the trail. 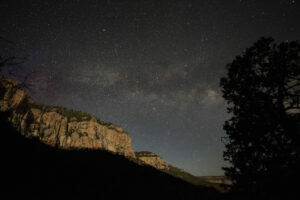 I used the super wide angle fisheye lens to get the surrounding canyon walls and the distant landscape illuminated by the waxing moon. Climbing out a cliff was brilliantly lit by the moonlight so I stopped to take a few shots. My main worry about the climb out was avoiding the mule poop, since they use the trail to ferry visitors down and back out of the canyon. My headlamp was bright enough so I avoided disaster. A cliff halfway up the Kaibab Trail. That backhoe looks like the one that was in our back yard!